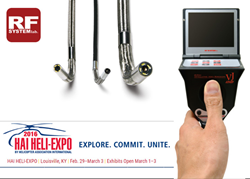 RF System Lab borescope experts Casey O’Tool and Jess Kuznicki are heading to the Kentucky Exposition Center in Louisville, Kentucky for the 2016 HAI Heli-Expo from February 29th to March 3rd. The Heli Expo is the world’s largest trade show dedicated to the international helicopter community featuring 1.2 million square feet of space with 700+ exhibitors, 57+ helicopters on display and over 100 education opportunities including education courses, safety sessions, workshops, and forums; some designed specifically for maintenance professionals. This year, Casey and Jess are looking forward to returning to the Heli Expo for the fifth time and will be presenting the VJ-Advance articulating video borescope in booth 9346. The VJ-Advance has become a favorite with top names in aviation, especially the 3.9mm diameter borescope, which is the perfect fit for Pratt & Whitney engines. Interested attendees can begin the 2016 HAI Heli-Expo experience by visiting their website. Take a look at the HAI Heli- Expo schedule to check out 100+ events that offer attendees the chance to meet with peers, discuss current issues, and stay up-to-date in a changing industry.